A patient called Whole Woman’s Health of Fort Worth (the closest clinic to her) to make an appointment for an abortion after recently finding out that she was pregnant. 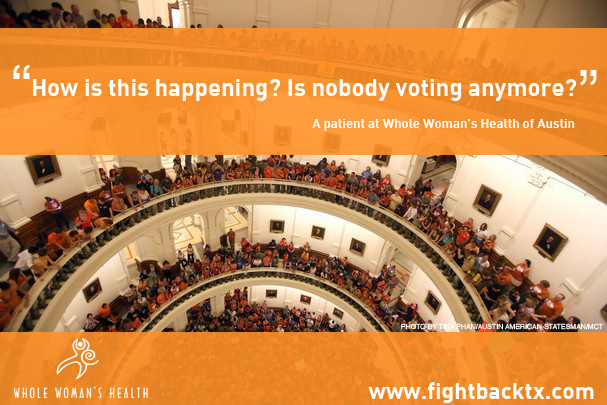 Whole Woman’s Health of Fort Worth did not have an appointment available for her within that week, and since the patient didn’t want to make the procedure more expensive by waiting for an appointment to open up, she drove to the next available clinic: Whole Woman’s Health of Austin. After driving to Austin, she didn’t realize that she would have to wait 24 hours after her first appointment to have the procedure itself (the state of Texas requires women to undergo a sonogram and then wait 24 hours before they have an abortion). Had there not been an appointment for a procedure available for her the next day, she would have had to go back to Fort Worth and then come back to Austin for the next available appointment, forcing her to wait until a longer point in the pregnancy before she could get an abortion. The patient didn’t realize there were so many restrictions just to have an abortion in Texas. After traveling from Fort Worth to Austin, having to undergo the 24-hour waiting period, and then unexpectedly staying in a hotel to have her procedure the next day, she was fed up with the red tape.